Widget for managing petty cash transactions. Is there a better alternative to PettyCash? Is PettyCash really the best app in Home Inventory category? Will PettyCash work good on macOS 10.13.4? 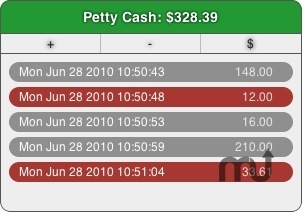 PettyCash widget... Every time you deposit to, or withdraw from, your petty cash, simply enter the amount here. Each transaction has a convenient timestamp. PettyCash needs a review. Be the first to review this app and get the discussion started! PettyCash needs a rating. Be the first to rate this app and get the discussion started!